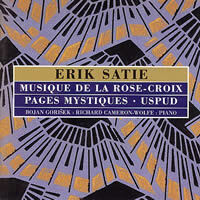 “Musique de la rose-croix, Pages mystiques, Uspud.” Erik SATIE: Trois Sonneries de la Rose + Croix (1892); Première Pensée Rose + Croix (1891); Deux Préludes du Nazaréen (1892); Prélude de la Porte Héroïque du Ciel (1894); Prière (ca. 1893-95); Vexations (ca. 1893-95); Harmonies (ca. 1893-95); Le Fils des Étoiles (1891); Uspud* (1892). Bojan Gorišek, Richard Cameron-Wolfe* (pno). LTM LTMCD 2469 (2 CDs) (http://www.ltmrecordings.com/). Distributed in the US by Darla Records (http://www.darla.com/). 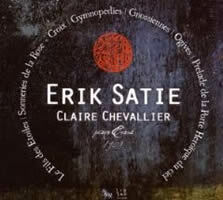 Erik SATIE: Gnossiennes (1890); Le Fils des Étoiles (1891); Prélude de la Porte Héroïque du Ciel (1894); Sonneries de la Rose + Croix (1892); Gymnopédies (1888); Ogives (1886). Clarie Chevallier (pno). Zig Zag Territoires ZZT080901 (http://www.outhere-music.com/en/labels/zig-zag-territoires). Distributed in the US by Allegro Music (http://www.allegro-music.com/). No desiccated embryos here. The LTM pair enshrines Satie compositions from the early to mid-1890s, the period preceding the ironic collections with the wacky titles. Several pieces correspond to the time Satie hung out with the Ordre de la Rose-Croix Catholique du Temple et du Graal, an esoteric sect overseen by Joséphin Péladan. We hear piano transcriptions of fanfares presumably premiered by harps and trumpets; however, having heard them on neutralizing piano, nothing else would seem more fitting. The two Nazaréen preludes echo gestures from the Sonneries. The calming Prélude de la Porte Héroïque du Ciel was conceived as incidental music. The Rosicrucian pieces are rich with contradictions: humble yet arrogant, naïve yet pietistic. They soothe in an effacing, numbing manner. Le Fils des Étoiles and Uspud are both three-act stage works. A Péladan scenario, Le Fils offers the subtitle, Wagnérie Kaldéenne (Chaldean Wagnery). Only Satie could attempt a Wagnerian-Babylonian epic containing typically bizarre instructions: “white and motionless,” “pale and hieratic,” “fall to the point of weakness,” “looking at oneself from afar,” and “finish for oneself.” The triplet fanfare from the rose + croix Sonneries filters through. Uspud is explicitly labeled a Christian ballet. Its three slow movements offer long spans filled with stumbling melodies and chords that wander, twist and repeat. Uspud is a rich and handsome pagan who, resisting temptation, is savaged by demons as a prelude to martyrdom. Somewhere between static chords and light café prattle, the music induces a rather solemn, trancelike response. But I can’t shake the idea that Satie is pulling a fast one. Cameron-Wolfe plays Uspud with consummate patience, as if there is no joke. Should you wish narration, try Furious Artisans FACD 6807. Published posthumously in 1969, the three-page Pages Mystiques contains Prière, the humbling single-sheet Vexations and three Harmonies. Gorišek does not pass through Vexations 840 times as directed, but often enough (I lost count) to be mildly addictive. Prière and Harmonies play as inept choral harmonizations a music-theory teacher would fling out the window, though I wouldn’t have been surprised to hear a jazz combo emerge from under the first Harmonie’s ninths and elevenths. Who can say whether Satie’s disregard for traditional harmony and development is intentional or accidental? Be that as it may, the music shouldn’t be rushed. Gorišek and Cameron-Wolfe, in commendably calm wise, take their good time. With Gorišek’s LTM work as a measure, Chevallier’s Le Fils des Étoiles offers a strong contrast. A track comparison shows the difference. Chevallier will often let Satie’s chords soak under the pedal. Neither player seems too slow or too fast despite their differences. Satie stands up to both. Satie: Le Fils des Étoiles, et al. “Music for Keyboard Instruments realised by computer.” Iannis XENAKIS: Herma (1961); Mists (1981); Khoaï (1976); Evryali (1973); Naama (1984). Daniel Grossmann (MIDI programming). NEOS 10707 (http://www.neos-music.com/). Distributed in the US by Qualiton (http://www.qualiton.com/). Xenakis live can be a riveting experience. Sweat often flies, and a performance often concludes with an air of triumphant accomplishment. I recall a Herma after which the pianist and audience were equally spent. Similarly, I’ve seen Chojnacka tackle one of the harpsichord works. I feared for the instrument’s flammability. This release’s MIDI piano and harpsichord timbres may irk the connoisseur. Extreme pitches for both instruments do not ring true (e.g., Mists’ opening), and the harpsichord’s sound is unvaried. The computer’s advantage is fidelity to the score: Ten mere fingers and two feet are hard put to rise to the challenge of Xenakis’ requests for incompatible pedaling under staccato notes or densely knit waves of clusters and scales. In those rare moments where Xenakis provides something snazzy or an approximation of a melody, the computer offers subtle inflections which a human would definitely bring to the fore. However, all the notes are there. As pure electronic music, the harpsichord pieces are most satisfying owing to timbre and the many volcanic clusters. There are places in all five pieces where slight left and right panning clarifies complexity. Auditioning computerized renditions of nigh-unplayable pieces offers few thrills. Yet, I don’t think a Xenakis fan would want to pass this up. 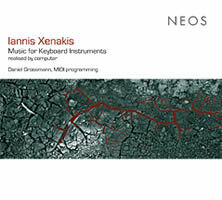 “World premiere: This is the first recording of Xenakis’ music for keyboard instruments realized by computer – unplayable by human hands!” greets us from the CD cover. We all know these are difficult pieces and that humans offer no better than approximations, yet that composer-performer-listener interaction is where the music’s fascination lies. Alan HOVHANESS: Oh Lord, Bless Thy Mountains*, Op. 276 (1991). Robert BONOTTO: Sibelius and the Cuckoo of Jarvenpää1 (1994). Ivan WYSCHNEGRADSKY: Méditation sur deux thèmes2 (1917, arr. J. Reinhard). Roland MOSER: Three pieces from Kabinett mit Vierteltönen* (1986-87). John CAGE: Daughters of the Lonesome Isle (1945). Stepan KONICEK: Praeludium, Blues und Toccata* (1992?). Maurice OHANA: Syrtes3 (1970). Charles IVES: Three Quarter-tone Pieces* (1921). Joshua Pierce, Dorothy Jonas* (pnos), David Gold1 (vla), Dave Eggar1 (vlc), Tom Goldstein1 (bells), Johnny Reinhard2 (bsn), Jodi Beder3 (vlc). Pitch P-200207 (1 CDR) (http://www.afmm.org/). An engaging program of mostly microtonal works features pianist Pierce. Although Cage’s Daughters of the Lonesome Isle doesn’t require special tuning, the preparations do alter pitches. 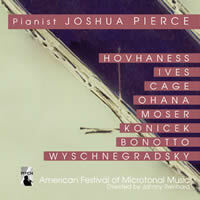 The Hovhaness, Moser, Konicek and Ives are for two pianos tuned a quarter-tone apart. Ever the innovator, Ives specified the second piano to be tuned slightly higher than the in-between point. Hovhaness’ three-movement prayer reminiscent of Liszt or Messiaen receives a supple treatment of the piano’s inflections. Moser and Konicek’s pieces integrate the two keyboards in dissonant, knotty fabrics. The Ives and Hovhaness stand out with quarter-tone melodies that alternate from piano to piano, note by note. Several pieces are small chamber works for piano with other instruments. Ohana’s spacious cello / piano duet Syrtes, the most remarkable discovery here, uses slow and pensive fifth-tones in what really deserves to appear more often in the repertoire. Wyschnegradsky’s Méditation, originally for cello and piano, is here arranged for bassoon and piano. It takes chutzpah to attempt microtonal music on the bassoon and Reinhard and Pierce pull it off. Bonotto’s quartet for viola, cello, glockenspiel and piano considers a particular bird whose call, falling between a major and minor third, Sibelius may well have heard in his garden. “Hommage à BACH.” Robert SCHUMANN: excerpts from 40 Clavierstücke für die Jugend, Op. 68 (1848); Scherzo, Gigue, Romanze und Fughette, Op. 32 (1838-39); Sieben Clavierstücke in Fughettenform, Op. 126 (1853); Waldscenen: 9 Clavierstücke, Op. 82 (1848-49); Kinderscenen: Leichte Stücke für das Pianoforte, Op. 15 (1838). Andreas Staier (pno). Harmonia Mundi HMC 901989 (http://www.harmoniamundi.com/). As admitted before, I am of the opinion Schumann’s madness was always lurking in the music. Whether intended or not, Staier’s excellent program reflecting Schumann’s admiration for Bach doesn’t dissuade me of that opinion, though I remain at a loss to identify specific examples. Perhaps Staier’s confessed impatience infuses some of the Op. 82 pieces with a manic twinge. In the Op. 32 collection, Scherzo, Gigue, Romanze und Fughette, we find a fidgety Gigue and a mercurial Romanze. Staier valiantly attempts Schumann’s metronome markings, offering a Kinderscenen that departs from well-trod paths in a fragmentary rather than sentimental reading. The latest works, seven Piano Pieces in Fugue Form, are wisely divided into two groups. As a display of Schumann’s contrapuntal skills, their dry themes defy Romantic intent. Rescored for string quartet, they’d probably sound like Beethoven. 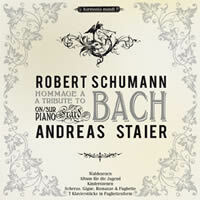 A big selling point is Staier’s 1837 Érard, the nasal attack and quick decay of which brings a welcome soundscape wherein Schumann isn’t beset by stomping chords and mushy harmonies. Op. 82’s No. 7, Vogel als Prophet, becomes wispy and ephemeral. 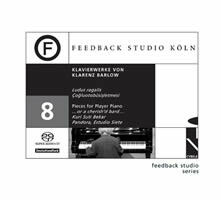 “Feedback Studio Köln 8.” Klarenz BARLOW: Ludus ragalis (1974-2003); …or a cherish’d bard… (1999); Kuri Suti Bekar (1998); Estudio Siete (1995); Pandora (1989); Çoğluotobüsişletmesi (1978; ver. for four pianos 2006). Hermann Kretzschmar, Irmela Roelcke, Jürgen Kruse, Benjamin Kobler (pnos), James Avery (cond.). Cybele SACD 960.308 (1 SACD) (http://www.cybele.de/). Distributed in the US by Qualiton (http://www.qualiton.com/). A curious collection of piano music, not just because the composer’s name changes depending upon whether you’re reading English (Clarence) or German (Klarenz). Ludus ragalis, a solo-piano work played by Kretzschmar, contains 13 preludes and fugues which blend Western keys with Indian ragas. In case you were considering their number, the cycle starts on F-sharp and progresses by fourths to G-flat. From a European perspective, these are strange-sounding pieces: as if notes are missing. I’ve no idea how an Indian-trained listener might perceive them. The central four pieces are for player piano. Barlow’s method is to translate something non-musical into a musical form, so that we end up hearing a player piano working through complex math or the roll’s punched holes correspond to a portrait’s pixels. Because Barlow prefers non-traditional keys, rhythms and tuning systems, an unsteady otherworldliness dominates. The final piece with the cumbersome Turkish title can be attempted by a single player. Here we have four pianists each at identically tuned pianos (every D, E, F-sharp and B is a quarter-tone flat). Çoğluotobüsişletmesi makes for a dense and intense half-hour. Overall, the scales and techniques blur the distinction between human and mechanical playing. Arne NORDHEIM: Listen (1971); Listen — Inside Outside (2005). Ludwig van BEETHOVEN: Sonata No. 32 in C minor, Op. 111 (1822). Einar Steen-Nøkleberg (pno), Mats Claesson (electronics). Simax PSC 1269 (http://www.simax.no/). Distributed in the US by Premiere Music (http://www.premieremusic.net/). Who’s the audience for this odd 47:38 program? 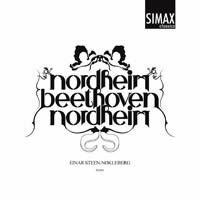 Folks who want to hear Beethoven probably don’t want Nordheim’s electronic shenanigans. Who would invest in Steen-Nøkleberg at a summa of the piano literature without knowing his work? Your intrepid reporter was keen to hear the Nordheim. Listen explores piano resonance, requiring variable pedaling under extreme trills, repeated notes, and precise washes at extreme registers. Listen — Inside Outside adds feedback and filtering for a dense cloak of ring-modulation and vibrant effects. I admit to fidgeting during the capably rendered Beethoven. Nordheim’s bookends did not put me in the mood for Op. 111. I did however appreciate the decisive demarcation between Listen and its double. Perhaps we’re meant to equate Beethoven’s Op. 111 with Nordheim’s Listen. If so, quite a stretch.